What Marine Life Can I See in The Egyptian Red Sea? When is the Best Time to Visit the Red Sea? Looking for More Places to Scuba Dive in the World? Egypt is known to be home to some of the worlds oldest civilizations. It bears testament to some of the earliest triumphs for mankind itself. Home to one of the Seven Wonders of the World, the pyramids of Cairo and also the well known Museum of Egyptian Antiquities which houses the legendary treasure of Tutankhamen. However, Egypt is much more than sand, pyramids and ancient monuments. It is a cruise down the river Nile, hot nightlife and a luxury hotel, it is an invigorating desert, especially for us scuba divers, it is the Red Sea and the Red Sea wrecks it has to offer. Just beyond the shoreline, you will find, beautiful coves, millions of reef fish, coral gardens, reef walls, azure waters, incredible visibility and wrecks. Everything that attracts the adventure divers and mark the Red Sea as a world class diving destination. No matter how beautiful and impressive the above water attractions may be, the real beauty and jewel in the Egyptian crown has got to be the astonishing diving. The Thistlegorm is a World War II ship wreck which is located in the North of the Red Sea in the Strait of Gubal. The Thistlegorm is a former 128 metre long British transport ship and sunk in 1941 after being hit in a German air attack. A dive to this British supply ship is unquestionably worth it. For a once in a lifetime opportunity to lapse inside this real World War II time capsule, which was buried by a storm of German bombs while on route to deliver a cargo of supplies to allied troops in Suez. After the Thistlegorm sank, the ship lay undisturbed for around 14 years. The shipwreck is in very good condition, and you are able to see some of her cargo remains which included; rifles, motor bikes, train carriages and trucks. The SS Thistlegorm is now one of the well known Red Sea wrecks in the world. This outstanding ship wreck draws thousands of scuba divers to its location each year. The best thing about diving Thistlegorm and what makes this wreck stand out from the rest is the artefacts that you can see underwater there. By the wreck you can find 2 tanks, jeeps, motorbikes, 2 locomotives, army trucks, various spare parts for cars and planes and stacks of rifles. It really is like diving with history, a time lapse through the past, and a real eye opening experience. It is recommended that you take two dives when diving Thistlegorm, in order to see the entire ship as there are so many different things to see. Great for those adventurers and a perfect location if you like wreck diving! Entrance is possible into the hold, and this allows you to discover various items. Here you will also be able to see the anti-aircraft gun. A trip to the Thislegorm wreck today, really is like travelling through time. Many of its visitors sense high emotions during this particular dive. The scene is that of a bomb site, which in reality, is exactly what it is, with visible signed of major destruction and devastating loss. The SS Thistlegorm wreck is a war grave, a giant underwater museum, a unique piece of military history and a real opportunity to walk through the past during a period when our free world was under threat from one of the most dictatorial regimes of modern times. 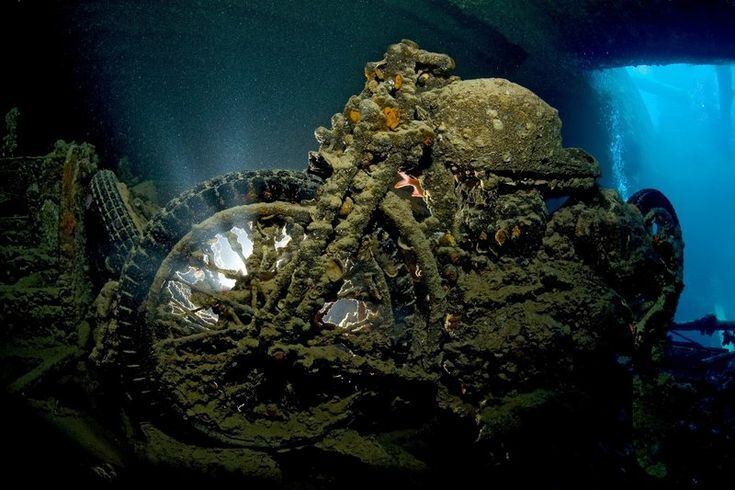 The Thistlegorm has lain at the bottom of the ocean for over sixty years now. This famous vessel has undoubtably been the subject of much drama and activity during its two lives, as both a sea going merchant ship and also as a world class scuba diving site. Despite extensive interest and public knowledge in the Thistlegorm, this ship wreck continues to inspire mystery. It continues to attract controversy from beyond the grave and all round speculation. Divers can visit the wreck from Sharm El Sheikh by daily boat or during a weeklong safari. Located on a bed of just thirty metres in good visibility this is the perfect wreck dive where much of the original cargo still remains. The bow is just fifteen metres below the surface and the propeller at twenty-seven. The wreck is located in a remote location. The dives are deep, the bottom times are long and the bulk of the dive time you will find is spent exploring the dark in the narrow interior of the vessel. Divers with advanced certification and experience are a must. It is recommended that divers have the following speciality courses; Peak Performance Buoyancy, Wreck and Deep. Entrances are accessible to all areas of the wreck for recreational divers, although technical training, such as nitrox, dual tank set up and decompression diving will allow great depth of exploration on each dive. Occasionally, currents may be strong, however mooring lines are usually tied by guides to allow divers to make a more comfortable descent down to the shelter of the ship wreck. Divers are able to explore the ships holds once inside, this is where they will see time has stood still. Laid stacked where it was loaded in 1941, divers can discover trucks, motorbikes, guns and wartime cargo which never reached its destination. Even after several hundred dives on the SS Thistlegorm, it must be said that after so much enticement, there is always something new to discover and see. Recently, a local diver has claimed that he came across a newly discovered locomotive 150 metres away from the wreck. Now the race is on for divers to reach and photograph the engine along with the ships funnel, which are both, allegedly, are still attached to the deck below, clean off of the ship by the explosion. The marine life surrounding the Thistlegorm wreck really is great. Just like most areas within the Red Sea, here you are likely to encounter a vast variety of reef fish, batfish, large schools of barracuda and snappers. Turtles are not uncommon and giant schools of jacks can be caught swimming past in their large groups. On each dive, you can expect the Red Sea to offer you an amazing diversity of fish every time. Across the colourful coral walls, you will encounter thousands of anthias sweeping across complete with wrasse, blue spotted rays, coral groupers, butterfly fish and angelfish. If you are not too caught up in all of these beautiful attractions, keep your eyes pealed – you may be lucky enough to spot that majestic whale shark gently cruising past. The desert coastline of the Red Sea very rarely sees any rain, which means that there is almost no freshwater runoff, making for great visibility and awesome scuba diving conditions all year around. Dive conditions do vary by season, during May to October the water temps are around the mid 80s, the weather around this time is scorching hot. In the winter from November to April, Egypt hosts more comfortable air temperatures meanwhile the water can drop to about 70 degrees or even lower. Note – Travel to any destination may be adversely affected by conditions including (but not limited) to security, entry and exit requirements, health conditions, local laws and culture, natural disasters and climate. Regardless of your destination, check your local travel advisory board or department for travel advice about that location when planning your trip and again shortly before you leave. Major Airports – Divers enter at Hurghada and Sharm el-Sheik International airports. You can also fly through Cairo and connect to your destination from the same terminal. Topside Attractions – Visit the pyramids and the Museum of Egyptian Antiquities, take a camel ride through the desert or a cruise down the Nile. Thanks for reading, if you want to read about more and other highly rated scuba diving destinations in the world, then check out the best diving in the world. Know another great dive location? We would love to hear about it in our comments below.